Union Textile Minister Shankarsinh Vaghela has ordered a departmental probe against Development Commissioner (Handicraft) Tinoo Joshi to investigate allegations of mismanagement and extending favours to her friends. In the wake of large-scale live bombs found in the imported metal scraps across the country, a petition has been moved in the Supreme Court seeking investigation into the matter at the national and international level by the intelligence agencies. Union Minister and Lok Janshakti Party chief Rambilas Paswan today said that his party would go it alone in Bihar in the Assembly polls due early next year. Mr Paswan told mediapersons here that his party had begun the process of selecting candidates for all 243 Assembly seats in Bihar. The Election Commission today decided to send a fresh team of officials to visit Mainpuri to examine all relevant records of the entire Lok Sabha constituency following allegations of large-scale rigging and booth capturing in the October 13 byelection there. Overruling objections by the External Affairs Ministry, Prime Minister Manmohan Singh has cleared the visit of Chief Election Commissioner T.S. Krishna Murthy to the USA to witness the November 2 presidential elections there. Bollywood actor Pooja Bedi, designer Manish Malhotra and model-turned-actor Yana Gupta at the launch of music album "Zoom Chakachak" in Mumbai on Thursday. Prime Minister Manmohan Singh is slated to visit Chennai on Saturday where he will combine an official programme with a courtsey call on key ally, DMK chief M. Karunanidhi. Shiv Sena chief Bal Thackeray’s defence of his son and heir Uddhav Thackeray for the party’s poor showing in the Maharashtra Assembly elections is beginning to rankle with the party’s rank and file. Though the BJP and the ruling AIADMK fell out after the general election, former BJP president, Venkaiah Naidu today congratulated Tamil Nadu Chief Minister J. Jayalalithaa for the slaying of former forest brigand Veerappan. The Centre has increased the dearness relief to freedom fighters and their eligible dependent pensioners by 5 per cent from Rs 1,170 to Rs 1,320. The relief will be given from August 2004, under the Swatantra Sainik Pension Scheme, a press note issued said today. The order to increase the relief from 39 per cent to 44 per cent has already been issued by the government, All India Freedom Fighters Organisation general secretary Satya Nand Yajee said. 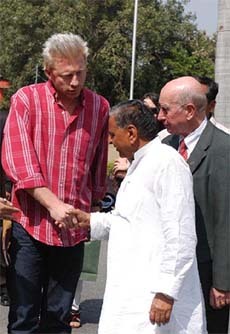 Former Wimbledon champion Boris Baker of Germany shakes hand with Uttar Pradesh Chief Minister Mulayam Singh Yadav in Lucknow on Thursday. Lok Sabha Speaker Somnath Chatterjee has postponed his meeting with leaders of political parties to November 23 for discussions to ensure smooth functioning of the House in the coming winter session. The first-ever conclave of the former Chiefs of Army Staff gets underway at Delhi from tomorrow with Field Marshal SHFJ Maneckshaw also attending it. Supporting prosecution charges against Major Surinder Singh, accused of reporting fake killings of enemy troops in Siachen, a witness, who had taken part in the “staged” encounters, told the military court here today that there had been no “actual kill or demolition of enemy bunker”. The Karnataka Government today announced a Rs-50 crore reward package for the state’s Special Task Force personnel and officers involved in the operations to nab forest brigand Veerappan. BHUBANESHWAR: Notorious forest brigand Veerappan died on the eve of Durga Puja which is celebrated as the triumph of good over evil. 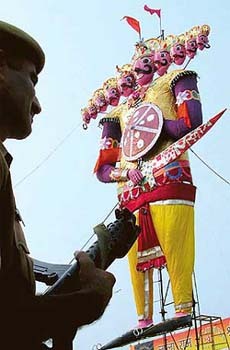 In the imagination of internationally reputed sand sculptor Sudarsan Pattnaik, it is Veerappan who fell to Goddess Durga, not Mahisasura, this Dasehra. A local court has sentenced chief of Khalistan Liberation Force Daya Singh Lahoriya to life imprisonment for kidnapping the son of senior Congress leader Ram Niwas Mirdha nine years ago. A Sahara Airways security officer was crushed to death by a Jet Airways passenger bus at Indira Gandhi International Airport here this morning. A wing of the historic basilica of Bom Jesu housing the relics of St Francis Xavier in old Goa was damaged in a major fire early today, according to the police. Sources said Mr Vaghela had ordered an inquiry against Ms Joshi, who had successfully managed to avoid the probe in the NDA regime. Earlier, former Textile Minister Kashi Ram Rana overruled the pleadings of his junior minister Basanagouda R. Patil, who had urged in his letter, dated April 28, 2003, “to order an independent inquiry of the working of the Development Commissioner (Handicraft) in the affairs of Dilli Haat, at the level of Secretary (Textile)”. Former Lok Sabha MP Abdul Rashid Shaheen, in his letter of April 23, 2003, had drawn attention of the then Minister of State for Textile to Ms Joshi’s handling of Dilli Haat. She was favouring a set of traders, who were being allotted stalls and place for display, Mr Shaheen said in his letter and pointed out that the commissioner was ignoring the interests of genuine craftspersons. The MP also offered to disclose the names of such traders who were given identity cards of craftspersons. They, he alleged, purchased handicraft products from poor craftsmen and then sold them at Dilli Haat. Apart from Mr Shaheen, another Lok Sabha MP Ram Das Athawale had also written a letter to Chief Vigilance Commissioner on July 3, 2003, seeking a probe into the allegations against Ms Joshi. Mr Athawale had listed 15 specific cases in which she was allegedly involved. He also alleged that Ms Joshi chose the ICS Domes (an NGO) for conducting the Sensitisation Programme, which was launched under her regime. The NGO was given Rs 21 lakh for undertaking a survey, Mr Athawale said in his letter and pointed out that a similar survey had already been conducted by other agencies. Under the UNDP programme, the ICS Domes was given Rs 45 lakh for different works, which, he alleged, were never completed. Documents in possession of The Tribune revealed many more details of Ms Joshi’s deeds during her tenure, which included favouring a set of NGOs and blacklisting others. A public interest litigation (PIL) by some residents of Ghaziabad, where 10 persons were killed due to explosion of a live bomb in metal scrap on the premises of Bhushan Steel and Scrap Company recently, urged the apex court to order a CBI probe at the domestic level and investigation by the Research and Analysis Wing (RAW) at the international level to find out the truth whether any international racket was involved in it. The PIL also sought a direction to the government to order a probe by a retired Supreme Court Judge as to how the scrap with live bombs had been allowed to be imported with impunity by scrap dealers throughout the country, posing a grave threat to public safety. The petitioners have also sought a direction to the Centre and the Uttar Pradesh Government to grant adequate compensation to the victims of the Ghaziabad blast. The PIL pointed out that the authorities had not taken any measure to keep a strict vigil on the import of hazardous scrap despite killing of eight persons in two explosions in metal scrap in Tughlakabad (Delhi) in 1991 and 1993, death of several people in the explosion of RDX hidden in the scrap in Mumbai in 1993, recovery of Israeli rocket shells near Kalkaji in the Capital in 2003, death of seven people being killed in a similar blast in Ghaziabad in 2001. Though the norms for the disposal of surplus small arms and large weapons (SALW) was the obligation of the country exporting the steel waste, it was the duty of Indian Customs authorities to ensure that no hazardous material was dumped in any part of the country, the PIL said. Union Minister and Lok Janshakti Party chief Rambilas Paswan today said that his party would go it alone in Bihar in the Assembly polls due early next year. Mr Paswan told mediapersons here that his party had begun the process of selecting candidates for all 243 Assembly seats in Bihar. He said that though the LJP was a coalition partner in the Congress-led UPA, the alliance did not exist in the states and there was no compulsion for him to fight the elections jointly with the RJD and the Congress. Asked if realignment of forces was required in Bihar in view of the RJD’s victory in the recent Lok Sabha byelection in Madhepura, the LJP Chief said there was no such need. He said the LJP had to remain “neutral” in Madhepura, as it could neither support the RJD candidate Pappu Yadav, who had broken away from his party, nor the nominee of JD(U), an ally of the BJP-led NDA. Mr Paswan said the LJP had earlier decided to contest the seat but did not as the CPM wanted to field its nominee. When the CPM failed to join the poll fray, the LJP remained neutral, he said. Mr Paswan said there was no question of the LJP aligning with the RJD but the party could consider the Congress as an ally in Bihar if it also felt the same way. He said the Madhepura bypoll had proved beyond doubt that the NDA had “failed” to present itself as an alternative to the RJD. Mr Paswan ruled out any understanding with the Janata Dal (United) as long as it stayed in the NDA. Mr Paswan said he would not discuss the Bihar elections with the Dal(U) leaders till they severed ties with the BJP. Replying to queries, Mr Paswan said he would not take any action against the LJP Lok Sabha member Ranjeeta Ranjan for canvassing in favour of her husband Pappu Yadav. “What else could she have done? I can understand her plight. Had she campaigned against LJP, we could have thought of some action,” he said. Touching on his party’s priorities, Mr Paswan said the LJP would promise measures for the benefit of minorities in Bihar. The commission had earlier sent a four-member team for an on-the-spot inquiry into complaints of rigging and booth capturing, which had submitted its report. “The commission after going through the report of the team has found a prima facie case for examination of all relevant records of the entire constituency and has, therefore, decided to call for all relevant records of the poll/repoll to the Election Commission of India for examination”, an EC press note said. A two-member team would be going again to the constituency for getting all relevant records duly sealed in the presence of all candidates on October 25, the press note said. The byelection in the constituency was necessitated following the resignation of Uttar Pradesh Chief Minister Mulayam Singh Yadav from the seat. A separate EC team had also gone to the Karchanna Assembly constituency following complaints of intimidation of voters and large-scale irregularities, it said, adding that the team was at present in the constituency. Further decision regarding the Assembly constituency would be taken after examining the report from the team. The commission had earlier suspended the counting of votes in these two constituencies. Since, in view of the above inquiries, it was not possible to complete the election in the Mainpuri parliamentary and Karchanna assembly constituencies before October 25, the EC has decided that election in these constituencies would now be completed before November 30, it said. The Model Code of Conduct would stand relaxed till further orders of the commission, it said. The EC has also taken note of various reports regarding the conduct of Observers in the Mainpuri constituency and was conducting necessary enquiries, the press note added. Mr Krishna Murthy is likely to leave for Washington on October 28, sources said. The CEC had received an invitation from the US government to watch the presidential elections there and had forwarded it to the External Affairs Ministry for clearance. However, the ministry had “declined” the request on the grounds that such a gesture may involve a reciprocal invitation to the US during elections in India, especially Jammu and Kashmir, sources said. Dr Manmohan Singh was to make this trip nearly two months ago but had to call it off at the last minute when he was laid down with a viral infection. AICC general secretary in charge of Tamil Nadu Salman Khursheed, who is coordinating this trip, met Dr Manmohan Singh in this regard today. On reaching Chennai, the Prime Minister will first go to Kalpakkam to inaugurate an atomic power project. On his return to the state capital, he will have a brief interaction with party workers, who are expected to call on him at Raj Bhavan. Before flying back to Delhi, Dr Manmohan Singh will call on DMK chief M. Karunanidhi at the latter’s residence. The courtsey call is essentially meant to keep up the friendly relationship with the DMK. “The Prime Minister is well aware that the DMK is an important ally and would like to use this opportunity to further cement their ties,” commented a senior Congress leader. While the Prime Minister will especially go to the DMK chief’s residence, Mr Karunanidhi’s arch political rival, Tamil Nadu Chief Minister J. Jayalalithaa is expected to meet Dr Manmohan Singh at the airport on his arrival, as demanded by protocol. She may also call on him at Raj Bhavan later. Congress president Sonia Gandhi is also expected to visit the state next month, primarily to address a public meeting. This will provide an opportunity for all warring factions of the state unit to sink their differences. Finance Minister P. Chidambaram, who has formally rejoined the Congress but is coy about admitting it publicly, is expected to make his first appearance on a Congress platform. The murmurs come just two days after Mr Thackeray blamed Muslims and migrants for tactically voting against the party and in favour of the Congress and the Nationalist Congress Party in Maharashtra. “Some of the candidates were wrongly chosen and this caused rebellion resulting in our defeat in many seats,” says a Shiv Sena leader. Still party leaders are loath to blame Mr Uddhav Thackeray directly considering the autocratic manner in which it is run. Leaders blame Mr Thackeray’s advisers for the fiasco. However, party leaders say Mr Bal Thackeray will not shift his support from his son to nephew Raj, who enjoys considerable support in the party. In fact, they expect Mr Uddhav Thackeray to sound more strident like his father in his bid to find a place for himself in the party. In a newspaper interview here today, Mr Bal Thackeray indicated that the Shiv Sena and the BJP would jointly take up the issue of Bangladeshis infiltrating into India. “There are six lakh Bangladeshis in Mumbai alone,” says Mr Thackeray. He felt that the Bangladeshis played a major role in the defeat of the Shiv Sena-BJP combine in the Maharashtra poll. Mr Thackeray further said that he would join hands with new BJP President L.K. Advani to raise the issue of infiltrators cornering prime opportunities in Mumbai and other cities. He, however, did not spell out his party’s strategies against the Bangladeshi migrants. Mr Naidu came down heavily on human rights groups for raising awkward questions about the circumstances of Veerappan’s killing and demanding a probe. “There is no need for any inquiry, as is being demanded by these groups, into the elimination of someone who was a menace to society,” he added. India and the United States today made “substantial progress” in implementation of Phase I of Next Steps in Stratetgic Partnership (NSSP) and identifying steps for Phase II which will have a broader scope and application diplomatic sources told The Tribune. The highly technical talks, conducted from morning till evening under the aegis of the India-US NSSP Implementation Group, were headed by Mr S Jaishankar, Joint Secretary (Americas) on the Indian side and Ms Christina Rocca, Assistant Secretary of State on the US side. This was the first meeting of the NSSP Phase I Implementation Group. Both sides decided to keep the nature and outcome of the talks under wraps in view of their sensitive character, sources said. With the Budget Session adjourning ahead of schedule following disruption of proceedings over the issue of “tainted” ministers raised by the BJP-led NDA, the Speaker decided to convene a meeting of leaders of all political parties to evolve a consensus to ensure that business was carried on smoothly. Ahead of the meeting, Mr Chatterjee will have separate meetings with leaders of the two main political parties - the Congress and the BJP - on October 26 and 28 respectively. Earlier, he had called a meeting of leaders on November 8. He will be eliciting views of leaders of these parties on how both Houses can function smoothly and evolve a formula that can be discussed at the November-23 meeting, sources said. The meeting with the Congress and BJP leaders will also be attended by deputy leaders and chief whips of the parties. Generals KV Krishna Rao, OP Malhotra, SF Rodrigues, Shankar Roy Choudhary, VN Sharma, VP Malik and S. Padmanabhan would be some other former Chiefs of Army Staff who would attend the conclave, organised specially at the behest of Chief of Army Staff General N.C. Vij. Sessions will be held over two days to seek the advice of this distinguished body on the `State of the Army’ as viewed from outside. The conclave will dwell on the current operational scenario at macro level, the new Army doctrine and apprise the former Chiefs of major welfare measures underway for providing better educational and promotion avenues, health and housing schemes for all ranks in the Army, as also about Mission Olympics. “There were no kills or demolition of enemy bunkers and everything shown in videos (of the encounters with enemy troops) was staged,” prosecution witness Phatta Bahadue Thapa told the seven-member General Court Martial jury, headed by Brig A.D.S. Grewal. Thapa was replying to a question from the jury after closing of his cross examination. Each of them would be given a cash reward of up to Rs 5 lakh, a free housing plot, special medical allowance and one increment in salary, Chief Minister N. Dharam Singh said at the Police Commemoration Day function here. The expenditure to the state exchequer on this account would be around Rs 50 crore, Mr Dharam Singh said as he commended the Karnataka and Tamil Nadu STF for ending the Veerappan menace. So he and his students of the Golden Sand Art Institute, Puri, have created a face of Durga and dead bandit Veerappan as Mahisasura on the Puri beach in Orissa. Pattnaik recently won an International Sand Sculpture Championship in Germany for a 25-foot-high statue of Lord Hanuman as the lone Indian representative in the Sandsation championship in Berlin this year. He has represented India in 23 international sand sculpture festivals and last year won the second prize in a contest in Spain. Pattnaik can often be seen working at the Puri beach and his sculptures on the torture of Iraqi prisoners in the Abu Ghraib prison, Saddam Hussein, conservation of Olive Ridley turtles and Athens Olympics has received wide acclaim. Sudarshan has always come up with topical sculptures to draw attention of the people to issues and events. A local court has sentenced chief of Khalistan Liberation Force (KLF) Daya Singh Lahoriya to life imprisonment for kidnapping the son of senior Congress leader Ram Niwas Mirdha nine years ago. Judge B.L. Lamnor also sentenced Lahoriya’s wife Suman Sood, alias Kanwaljeet Kaur, to seven years’ imprisonment for her involvement in the case. Lahoriya kidnapped Rajendra from a residential colony on February 17, 1995, and demanded release of Punjab terrorist Devendrapal Singh Bhullar, who was serving life term in Delhi in a case of bomb attack on the then youth Congress leader Maninderjeet Singh Bitta. Rajendra was rescued by the police from a house at the outskirts of Jaipur after a shootout in which terrorist Navneet Singh Kandia was killed. However, Lahoriya, his wife, and another terrorist Harnek Singh fled from the scene. The couple later fled the country on forged passports and were brought back to India after their arrest in the USA. Harnek Singh is currently in custody of the Punjab police. The accident took place at 5.45 am while the bus, belonging to Jet Airways, was negotiating a curve between Bay 22 and 29 close to the departure lounge of the airport, said an investigating officer. “Driver Sanjay Bhatnagar was arrested and a medical test was conducted on him to ascertain whether he was under the influence of alcohol but it was found negative,” reports said. Balbir Singh (27), a resident of Khandsa village in Gurgaon, had resumed duty at 5 am and was guarding the Sahara Airways plane parked at Bay 29. He was sitting on the blind curve near the bay area when the bus crushed him, said the police officer. According to the police, parts of the ‘Retreat House’ adjacent to the basilica were gutted. The cause of the fire has been attributed to a short circuit. The building was renovated just a few weeks ago in preparation for the exposition of the saint’s relics next month. The exposition, held every 10 years, is a major event in Goa. Church officials say the exposition this year could be the last since the saint’s relics — his undecomposed body — is deteriorating. The basilica was built in the 16th century to house the relics of St Francis Xavier which was brought to Goa. According to reports from Goa, the fire spread as the fire brigade could not reach the basilica on time. Though located nearby, the fire officials went looking for the wrong church, officials say. The construction of the church which began in 1594 was completed in 1605. The relics of the saint are housed in a silver casket, which at one time was covered in jewels. Myanmar’s strongman, Senior General Than Shwe, will pay a six-day State Visit to India from October 24, the Ministry of External Affairs announced today. Gen Shwe, who is the Chairman of the State Peace and Development Council of Myanmar, will meet President APJ Abdul Kalam and Vice-President Bhairon Singh Shekhawat and will also hold wide-ranging talks with Prime Minister Manmohan Singh on bilateral, regional and global issues of mutual interest and concern. External Affairs Minister K Natwar Singh will call on the visiting dignitary. Gen Shwe will be accompanied by a high-level delegation comprising eight Cabinet Ministers including ministers for industry, energy, rail transport, communications, science and technology and health. The new Foreign Minister of France, Mr Michel Bernier, will undertake his first-ever visit to India from October 27. During the two-day visit, Mr Barnier will have talks with his Indian counterpart K. Natwar Singh and will also meet Prime Minister Manmohan Singh, Defence Minister Pranab Mukherjee, UPA Chairperson Sonia Gandhi and leader of the Opposition L.K. Advani, a French embassy release here said today. The Delhi High Court today granted bail to industrialist Anil Nanda, accused of bringing goods worth over Rs 50 lakh into the country without paying customs duty. Justice H.R. Malhotra ordered Nanda’s release on bail upon furnishing a personal bond of Rs 50,000 and one surety of the like amount, Nanda’s counsel R.K. Anand said.